An abscess on your tooth is a major deal. It is an infection that can spread far beyond your tooth. If it is left untreated, an abscess can poison your bloodstream and make you incredibly sick. The best time for you to deal with an abscess is right when it shows up. If you start noticing any of these signs, you need to make sure that you call your dentist right away. Typically, you will notice a tender spot in your mouth first. It may not be much, but it just seems a bit sore. Then, as the abscess grows, it will often swell and become warm. As this happens, you will typically notice an increase in how tender the area is. This process can happen slowly over the course of a few days or a week, or it can happen over the course of just a few hours. If you go from feeling find to having a sore spot in your mouth and a fever, you need to get seen. An abscess can go from a minor problem to a major deal in a very short amount of time. There is only so much space an abscess can swell into, and if it uses up that space and still needs more room, it will burst. This can put your body's health at risk. Contact our office at the first sign of a problem in your mouth. It is simply not worth the risk that you have an infected tooth. Take the symptoms seriously, and go in and see someone as soon as they can fit you in. 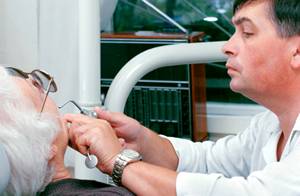 From there, you can speak with your dentist about what is going on and plan the best course of treatment together.